Customize your massage with these treatment extras. Sit back and let your tootsies get some special attention. First the feet slip into a soothing mint and tea tree foot soak. This is followed by a peppermint, sea salt foot scrub to exfoliate those rough spots. 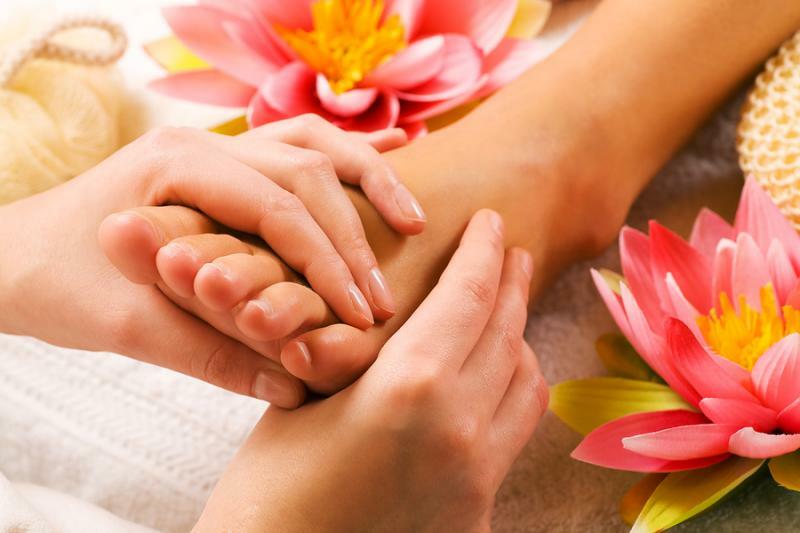 Close your eyes for the reflexology based foot massage and melt away. Exfoliate and nourish your hard working hands or feet. Begin with a citrus, brown sugar scrub to exfoliate, energize and condition. Once that old skin goes, we seal in the moisture and pamper the hands/feet with pure, raw Cocoa Butter. During the cold winter months, or just for the warm cozy feeling, this treatment add-on gets your muscles and feet all warmed up. Wet, heated towels are applied to the back, chest and feet during your massage. A warm, moisturizing mask will also be applied to your feet before they are wrapped, leaving them decadently soft. Essential oils can be added to this treatment for aromatherapy purposes. • Dry skin brushing helps to shed dead skin cells, which can help improve skin texture and cell renewal. • Dry skin brushing increases circulation to skin, encouraging your body’s discharge of metabolic wastes, which greatly aids the lymphatic drainage of the entire body. When the body rids itself of toxins, it is able to operate more efficiently in all areas. • Dry skin brushing also helps to tighten the skin because it increases the flow of blood. Increasing the circulation to the skin can also help reduce the appearance of cellulite. • Dry skin brushing stimulates the lymph canals to drain toxic mucoid matter into the colon, thereby purifying the entire system. This enables the lymph to perform its house-cleaning duties by keeping the blood and other vital tissues detoxified. After several days of dry brushing, you may notice the gelatinous mucoid material in your stools. • Dry skin brushing helps with muscle tone and more even distribution of fat deposits. • Dry skin brushing also rejuvenates the nervous system by stimulating nerve endings in the skin. • Dry skin brushing helps your skin to absorb nutrients by eliminating clogged pores. Healthy, breathing skin contributes to overall body health. • Individuals who sit at a computer screen all day long will particularly take pleasure in the benefits of skin brushing. People who have inactive lifestyles or jobs usually experience stiff and sore necks and shoulders that reach even into their arms and down their spines and into their lower backs. Increased blood flow begins entering the areas brushed and you will experience an increase in electromagnetic energy that permits you to feel energized and invigorated. • LADIES—Cellulite is toxic. Cellulite is toxic materials that are accumulated in your body’s fat cells as they are unable to be eliminated. So, rather than liposuction surgery, how about utilizing the “dry skin brushing” techniques coupled with an alkaline diet program and a great exercising routine. It will break down the unwelcome toxic body deposits and send them scurrying out of your body through the elimination channels we discussed above. Only the highest quality, steam distilled essential oils are used in massage treatments and extras. In most cases we can omit or change a scent to your preference. Please note we have a 24 hour cancellation policy. Details of this policy can be found on the Contact Us page.